Imagine this: You’re about to graduate college, your internship is in place and you’ve just moved away from campus and the safety net of your family. A visit to the doctor and BOOM. You’re now a young adult with cancer. Or, you’re a young new parent to a beautiful baby boy. You’ve just purchased your first home and all of a sudden…cancer. This happens day in and day out in the US. The Samfund is currently the only organization in the United States designed to assist young adults (17-35) as they regain their financial footing after expensive cancer treatment. The economy presents challenges for any young adult, but with the extra burden of cancer, those with a history of the disease struggle even more. Through direct financial assistance and free online support and education, The Samfund helps young adults move forward toward their personal, professional, and academic goals. We’re inspired. Over seven years, The Samfund has awarded a total of more than $700,000 in grants to individuals across the country, for transitional issues such as education, living, employment and lingering medical expenses. The financial struggles are only one aspect of surviving cancer, so The Samfund also provides resources for caregivers, family building, legal, work and lifestyle support, undergraduate tuition assistance and more — all because #cancerisntfree. ePromos Promotional Products, Inc., a leading online distributor of custom logo merchandise, has awarded $500 worth of promotional products to The Samfund. They received this award because of their endless contributions toward young adults with cancer. This award is given as part of Giving Tuesday and the ePromos For Good contest. #GivingTuesday is held annually on the Tuesday after Thanksgiving (in the US) and the widely recognized shopping events Black Friday and Cyber Monday to kick off the holiday giving season and inspire people to collaborate in improving their local communities and to give back in impactful ways to the charities and causes they support. 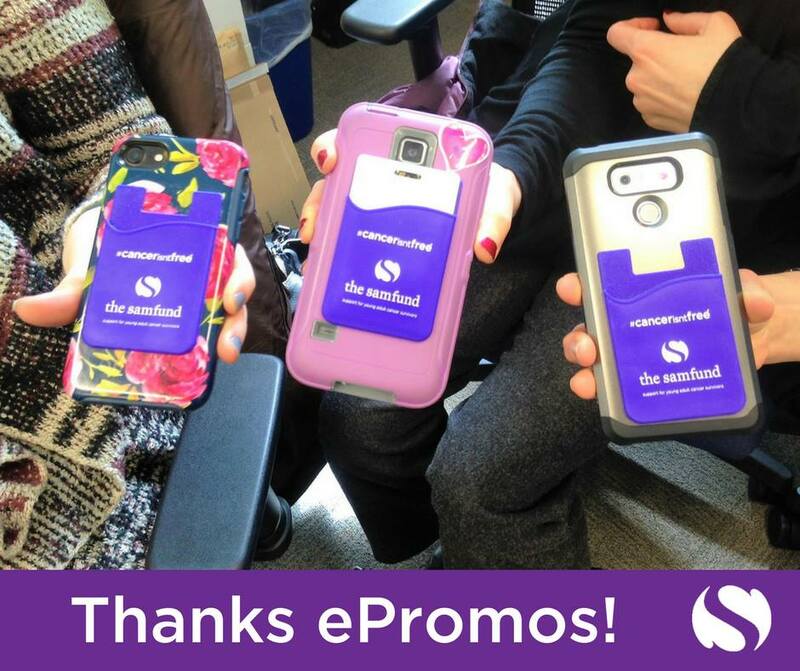 The Samfund used their winnings towards custom cellphone wallets to use as thank you’s for fundraising efforts and to promote their brand. Look how great they turned out! Interested in Applying for our ePromos for Good Program? Click here.